Schmincke, Pebeo, Royal Talens, and I've been having fun with all of them. But my experiments haven't been very systematic, and I often mix several brands on a given painting outing. One of the brands of gouache I just haven't tried out yet is Caran d'Ache, though I use their water-soluble colored pencils all the time. "A. Opacity : As you say, our definition of « gouache » (from Italian « guazzo ») means a rather opaque, covering « sauce » with a certain covering power on dark undergrounds." "B. Water-solubility : According to our definition, gouache needs to be water soluble and stay water soluble. We do not understand how other producers can label colours writing things like : « Acrylic Gouache ». It can’t be both! Either it’s acrylic and permanent after drying (I call it a « liquid plastic » that hardens when water evaporates ; polymerization), or it’s gouache and you can always dissolve layers underneath." "C. Matt surface : Typical for a good gouache should be it’s matt aspect when dried. It should be close to the pure pigment powder aspect and by this make a distinction to satinated, creamy or oily aspects of other types. 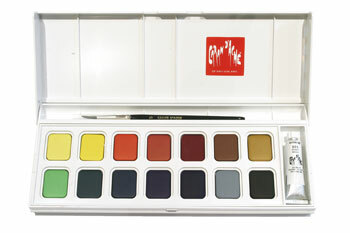 This characteristic makes gouache so unique and essential for studying and teaching « colour mixing » based on primaries etc.!" "To clarify this, I think you need to explain to your readers the terms « Gouache », « Plakatfarbe [in English we'd say "poster paint"] », and « Tempera » that all mean a kind of opaque water colour." "Even in our own range, we’ve known and still know different types of « gouache ». We only speak for our own gouaches:"
"Last remark : Our philosophy is that a good gouache colour, despite its covering qualities, should still be luminous and powerful. This is the reason why we use a strong concentration and a high quality of pigments that we carefully refine in our mills and grinders in our Genevan factory." "I often compare a colour with coffee or chocolate : Concentrated black coffee made with the best beans has got power and makes an « explosion of taste» in your mouth and throat (similar effect on paper with highly concentrated watercolour without filler !). Now, some people like to add some milk in their coffee or producers add water to decrease the costs of the expensive coffee powder. That’s all ok, but if you add too much milk (filling material !) or too much water in your coffee, it loses its original power and taste, it just gets a characterless muddy sauce!" "In other words : You can always break down a highly concentrated colour and lighten or darken it, but you can never « pimp up » a colour with too much filler, white or similar ingredients." "Wishing you all the best for your great project, with kind regards from Geneva, Adrian"
This makes me want to try Caran d'Arche! I like what he says about what gouache should be and his final analogy with coffee. Perhaps it's because it always takes me back to my Art Center days, but I find gouache to be the best medium for getting me to think about basic fundamentals of painting. I see it as a no nonsense, no frills approach where color, value and design become the paramount thing. Thanks for all your useful and interesting posts over the years! What a wonderful response! Informative but also it's lovely to hear someone talk about his product in such a lively way. I've wanted to try the Caran d"Arche pans and this might be the impetus to do so. Thanks James for all the great info on gouache. Great post. The link to the retail info for the "extra-fine' in small tubes seems to connect you to the "studio" version rather than the "extra-fine." 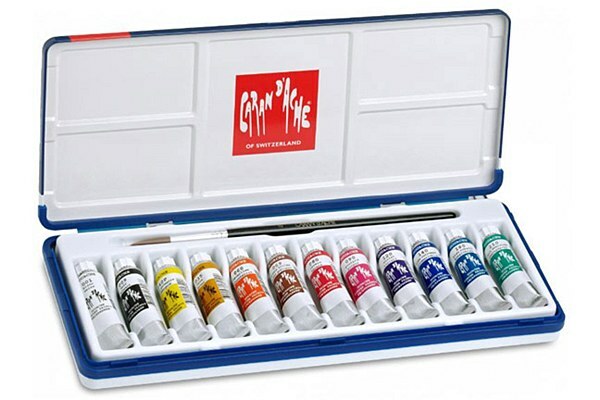 Steve, I noticed that the term STUDIO seems to be used on the packaging of all their tubed gouache, even the more expensive sets that seem to be geared more toward the professional artist. If someone can share a link to a better retail page, please let me know. Katybee, me too. I've been delighted to discover that at every one of the paint manufacturing companies there are interesting people with definite opinions, based on the knowledge of the making process and on their end use by artists. Adrian is a terrific spokesman for the company....and I'll never look at coffee the same way now! Allen, yes, we went through a lot of gouache at Art Center painting flat swatches. It's great for that, of course, but I would take it home and try it out for landscape painting, and I fell in love with it even more. 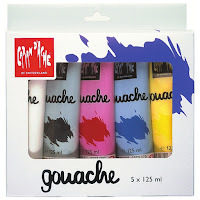 What is the difference between the Gouache extra-fine in small tubes and the studio sets? Are they both artist grade or are the studio ones the student grade? It was not clear from their correspondence. As always great info James. Matt, it seems a little confusing to me, too. Both seem to be called "Studio," but the finer grade sells for about $53.00 / dozen and the less expensive grade is about $40.00/dozen. I would imagine that they're both pretty good quality—neither set is as inexpensive as some other brands. By comparison, you can get a set of 18 tubes of Holbein's regular gouache $34, which is a pretty good deal. I've tried the Holbein gouache and they're good. Usually in gouache, a higher price translates to more pigment loading or more expensive pigments, but in general if you shop around the sets are a good way to get a decent price. This clears up a lot and tells me I am smarter than I thought. I started with Schmincke gouache and it IS water soluble -- which made me wonder when I came across some other brand that was not. Being originally an acrylic artist, I thought that this was a bit odd. I figured it was really acrylic in a tube. Now it seems I was closer to right. I've also used Holbien and liked it -- and it was water soluble. Great post. Thanks! Thanks, Steve. I added that link into the post. HNK, As I recall, I bought just a tube of the white, to use with watercolor. I'll do a whole video on grids and viewfinders, just haven't gotten to it yet. It's a fun topic. DKatie, Yes, the trade terms "Acryla Gouache" or "Acryl Gouache" do muddy the waters a bit, because it's really best described as an opaque, matte acrylic. It sacrifices one of the most attractive features of regular gouache, its solubility when dry. I've been using the acrylic gouache more for painting maquettes, where I want the closed surface and the matt finish. I am a pastel artist from Germany and was involved in the testing of the pastel pencils and cubes bevor Caran D' Ache launched them. We were even invited to the facory in Geneva. I was deeply impressed by the knowledge, expertise and friendlyness of Adrian and the heartblood the company puts into producing high quality products. Love Caran D'Ache gouache;I have a setI bought 30 years ago & most of it is still going strong! One you didn't mention was Lefranc--I just ordered some to try. It got 5-star reviews on Blick--and it's on super sale through Friday, too! Interesting to read his rather purist reaction to products like Acryla from Holbein. But I would say he's technically correct. It becomes a hybrid class of product. Not 100% like gouache or acrylic, but for myself I do like Acryla a lot. I love Caran d'Ache's pencils, but have never seen a paint product of theirs in a US art store. i've been working in gouache for about two years now, i use m graham, because of the light fastness. i wish they'd come out with more colors, although some of their regular watercolors seem to work well as gouache too. i only use gouache on black paper atm, although i am looking for a good source for dark paper in other colors that will stand up to repeated wetting. i haven't tried any other brands, as i remember the horror of gouache from when i was in art school.. (40 years ago)..... but i am delighted to find the m graham. also that you and other artist are working in gouache.